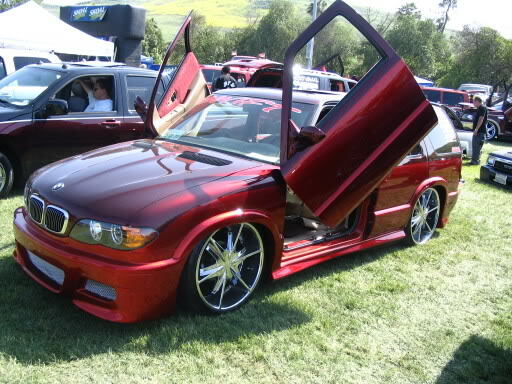 I seen this BMW/Blazer conversion, does anyone know if it is a kit you can buy? or how much it would cost to get it done custom. Why would you want to put a BMW front clip in a Blazer? Anyway, there might not be a kit readily available for that, and I never saw any picture of a similar mod before. LOTS of fab work.. LOTS. What about the 98 cadillac grill front end? I've seen a few of these, the fit looks good, does anyone know if this is a common swap? cheap...? It doesn't seem neither easy or cheap. Plus those front clips don't look so good at all in a Blazer. None of these will be easy or cheap. Its not something you can just bolt on. It would probably be cheaper to buy a 98 Cadillac Escalade. Guess I'll just have to go for the Bowtie Billet grill, which is nice anyway, only reason I'm looking into it is the grill on my winter blazer is cracked and all ratchet so thought I would look around and see what's available if it's on the cheaper side. If you see a blazer with a front end that is anything different than a blazer/jimmy or bravada, chances are it will not be cheap or easy.